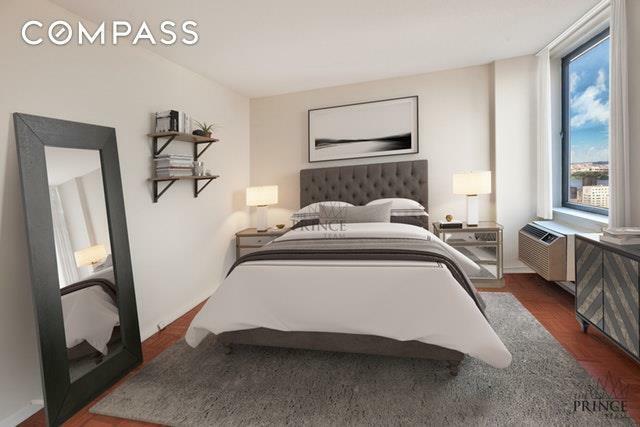 Make your home in the clouds in this fantastic Yorkville one-bedroom (convertible two-bedroom) condominium in a revered full-service building. 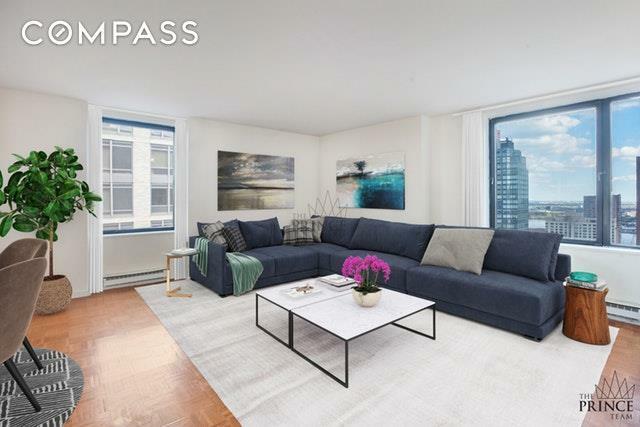 This is a great find, whether you're looking for a place to call home or an ideal investment property.Nestled on the Upper East Side, this spacious corner spans nearly 800 square feet and is surrounded by breathtaking views that span from the East River all the way to the George Washington Bridge. 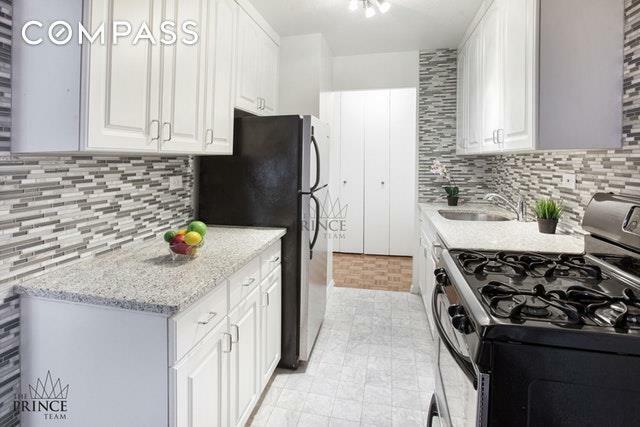 An inviting foyer entry opens to a renovated galley kitchen featuring stainless appliances, granite countertops, tiled backsplash and abundant white cabinetry. The large dining area just outside the kitchen can easily be converted to a second bedroom, and the oversized living room is sunny and spacious. Hardwood floors guide you to the huge king-size bedroom where a wall-to-wall California closet easily accommodates storage needs. The white-tile bathroom is just across the hall; another large closet is located in the entryway; and window treatments frame each lovely exposure in this high-floor haven. All major utilities (including gas, electric, heat and hot water) are included in the low common charges. 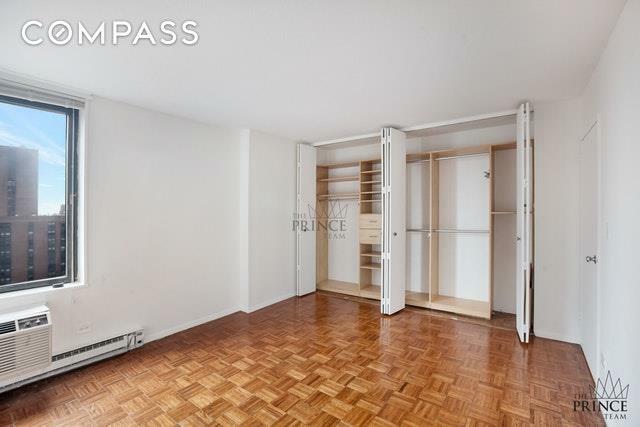 Photos of the apartment have been virtually staged. Ruppert Yorkville Towers provide an outstanding list of amenities and services, including a 24-hour attended lobby and concierge service, live-in maintenance staff, bike room, 24-hour laundry facilities, onsite parking with direct lobby access, valet services, an outdoor playground, plus newly renovated lobby and hallways. Theres a New York Sports Club with a swimming pool in the building with discounted rates for residents, as well as a terrace with barbecues. Open space can be found just outside at the gated pedestrian promenade block of 91st Street and adjacent Ruppert Park, plus Central Park is just four blocks west and Carl Schurz Park is four blocks east. Wonderful dining, nightlife, shopping and the brand-new Upper East Side Whole Foods Market and Equinox are all nearby. Transportation is a breeze with the Q train just seconds from your front door, plus 4/5/6 trains and ample Select Bus Service close by.Bike spaces available at $50 per spot per year. There's a capital contribution of $31.64/month. Please note that W/D are not allowed, and dogs aren't permitted.